This statistic displays the number of mental health treatment facilities in the United States that provide inpatient, residential, and outpatient services, as of 2017, sorted by their setting of services. There were 1,885 facilities providing 24-hour hospital inpatient services in the country. The United States will increase its expenditures for mental health services from 87 billion U.S. dollars in 2001 to some 240 billion U.S. dollars in 2020. The prevalence of different mental disorders can vary based on age group, ethnicity, and many other factors. 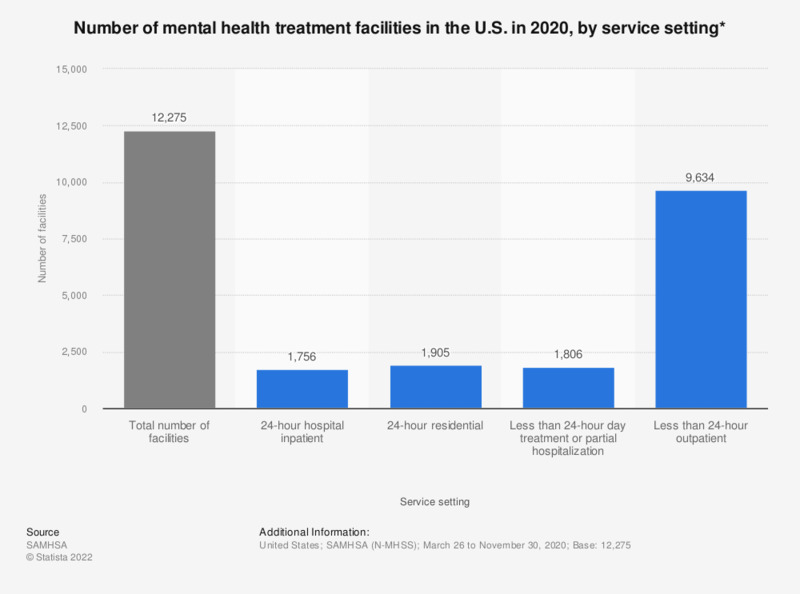 * Number of facilities sums to more than the total column and percentages sum to more than 100 percent because a facility could offer mental health treatment in more than one service setting. Includes facilities in the 50 states, the District of Columbia, American Samoa, Guam, Puerto Rico, and the U.S. Virgin Islands. This statistic includes only facilities which were eligible and completed the survey. What type of customer service do you use? What type of customer service do you offer as a company?